Eugene, Ore - The Eugene International Film Festival is proud to present “The Mountain Runners” in an April 7 screening at Thinking Tree Spirits . This award-winning, feature length documentary showcases America’s first mountain adventure race. It has been shown worldwide in track and field communities. In 1911, fourteen runners wearing cotton t-shirts and canvas tennis shoes would defy death in a race from their hometowns to the summit of 10,781 foot Mt. Baker and back. Two towns at the base of Mt. Baker were in the competition, Glacier and Deming, Washington. 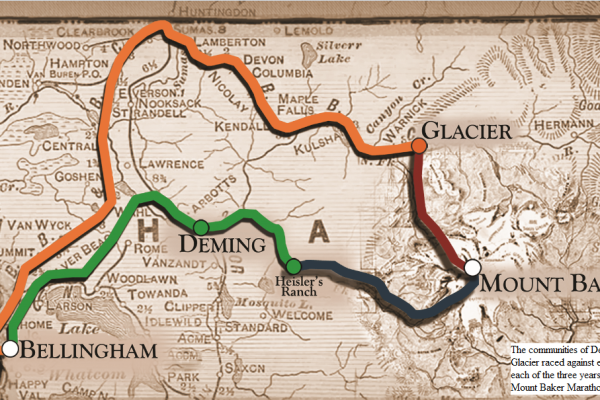 To reach their respective trailheads, one would use an automobile, the other a steam engine. Thinking Tree spirits, 88 Jackson St., Eugene, OR, will be hosting the screening of “The Mountain Runners” (90 minutes) in association with the Eugene International Film Festival, Saturday, April 7, 2018. Seating begins at 6:00 PM for the screening at 7:00 PM. Concessions and libations will be available. Zachary Corbett, Licensed Acupuncturist, will lead a discussion on personal care for runners following the screening. Admission is free. This incredibly dangerous event would only be held annually for three years. Then, with much heated debate regarding its safety, someone came to their senses after runners had fallen into crevasses, were pinned under their wrecked cars and the 1890 train had derailed with a full head of steam. The event was cancelled following the 1913 race. About Thinking Tree Spirits - Thinking Tree offers a unique setting among the copper pipes of camaraderie to enjoy a movie and the conversation that follows. Thinking Tree gin is becoming legendary among connoisseurs. In every bottle of their rum, vodka and gin is the spirit of Oregon to be enjoyed under the canopy of the Thinking Tree with friends. Gathering for an event at Thinking Tree Spirits next to the stills is much the same as being in the kitchen with mom as she bakes cookies. Imagination is inspired and rewarded. About the Eugene International Film Festival - EIFF is recognized by filmmakers worldwide for its filmmaking awards, career networking, tourist destination amenities and the camaraderie they have enjoyed while visiting the community. Some films hosted by the EIFF have received worldwide press converge of their red carpet premieres in Eugene. Local food and beverage offerings lend themselves to filmmaker networking with their peers and audience members. Some meetings have led to career advancing contracts. The Eugene International Film Festival is at the center of all that is good about Oregon. Resources: Trailer (running time 2 min 20 sec) - https://www.youtube.com/watch?v=E0VEpvdSj2w; Photos available upon request.